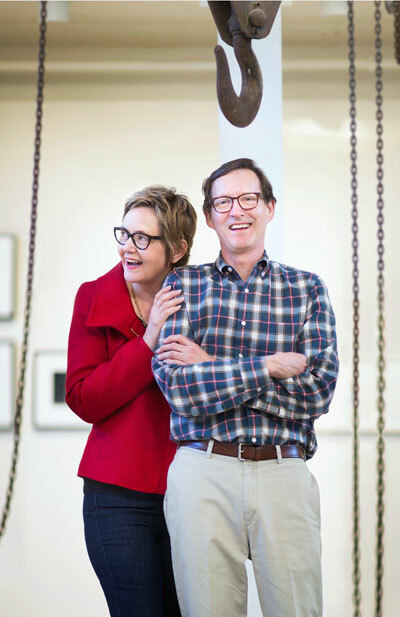 His desire to study art was so intense that Fred Bidwell, co-owner of the Transformer Station with his wife Laura, transferred from his hometown Boston University to study art history at Northeast Ohio’s bastion of the liberal arts. “Oberlin College was a very exciting place to go, especially in 1972,” he says. Fred aspired to become a fine arts photographer after graduating, but took on commercial projects to stay fed. Eight years later, tired of climbing ladders to get the right shot and taking orders from art directors, he switched to the other side of the rungs and got a job in advertising. A few years later, he found himself sitting in the cubicle next to Laura Ruth at Malone Advertising in Akron. Fred was named president of Malone in 1991, sold the agency in 2005 to J. Walter Thompson, which by then was part of WPP Group, the largest agency holding company in the world, and stayed on until last spring to run a joint venture between Thompson and Ogilvy Advertising. However, the more significant merger occurred in 1991, when Fred and Laura got married. Also deeply driven by a love of the arts, Laura had grown up in Akron with a painter for a mother and inspiration as she earned her painting degree at the University of Akron. Her first job entailed selling junior sportswear at the M. O’Neil Company, but when her employers discovered that she had an art degree, they transferred her to the advertising department and taught her how to cut and paste ads. Her father was a copywriter who had worked at Goodyear and then Malone Advertising, so she applied to the latter and found herself an art director in training, comparing notes with her new cubicle neighbor. Upon leaving Malone shortly after their nuptials, she freelanced as a graphic designer for six years. “At that point, I was at a fortunate position to have a lot of choice in my life,” Laura says. “So I freelanced less and got involved with some boards, including the Akron Zoo, the Akron Symphony, the Akron Art Museum, and got involved with the Boys & Girls Clubs. Volunteering my time was a real joy and privilege.” In 2007, she decided to make photography her art, so she bought a digital SLR camera, and that’s been her passion ever since. The year 1991 was an annus mirabilis for the Bidwells, since it is also when they initiated their first substantial acquisitions for what has become one of the finest private photography collections in the US. Two decades later, the collection’s size became the motivating force to buy the Transformer Station. “Focusing on photography was a smart way to make our collection more strategic,” Fred reveals. “Eventually, though, we needed more wall space to show all the pieces we had accumulated.” “Photography is a medium that is defining our era,” adds Laura. “So, it’s a really perfect time to focus on it, and it just constantly seems to lead to new ideas, approaches and really fascinating artists.” In less than a year, the Transformer Station on West 29th Street in Ohio City has had two successful shows, and the Bidwells have many plans for more provocative contemporary art exhibitions. The converted station that powered street cars until 1943 offers visually interesting architecture, and has served as a spacious and effective gallery space. Involved as board members or philanthropic supporters of numerous arts organizations in Akron and Cleveland, the Bidwells are acutely aware of Northeast Ohio as a region. “We live almost half way between the two cities,” Fred says. “We’re involved with and fans of both of them, and big proponents of having a more regional arts community.” Their choice to partner with the Cleveland Museum of Art was a direct acknowledgement of their desire to strengthen the region by giving the museum a prominent West Side presence. Fred believes it is the first and only private-public museum partnership in the country, and that the space will enable CMA to do more daring shows than it can in its University Circle home. “We’re going to have lots of fun with the space,” Fred predicts. “And we plan to give people plenty of reasons to come back.” The current show at the Transformer Station, “Todd Hido: Excerpts from Silver Meadows,” runs through August 23.